The design of the Brooks Launch 5 was appreciated for being appealing to the eyes. Several consumers welcomed its suitably lightweight nature. The cushioning system received positive feedback for being responsive and agreeable. According to some testers, the softness of the midsole foam evoked a feeling of running on clouds. Many runners considered this running shoe to be one of the most comfortable road companions. A lot of people lauded the spacious toe box; it allowed their toes to spread nicely with each step. Some runners felt that it didn’t need a break-in period; it was accommodating right from the start. Wearing this running shoe for the entire day didn’t cause any discomfort or fatigue. The sizing scheme followed the usual preferences of consumers. The arch of this shoe was apparently too high for some testers. A few runners felt that the width was a bit narrow. Calling the Brooks Launch 5 a suitable upgrade is an understatement. This neutral shoe reignited many runners’ desires for the long-standing series. They welcomed its appealing looks, its agreeable construction, and its comfortable underfoot experience. A few consumers had complaints about its width and arch, but that didn’t diminish the overall positive response. A couple of years ago, a friend told me to give the Brooks Launch 5 a go. I was running on the Adidas Boston Boost and I’d never considered the Brooks Launch until I tried the Brooks Ghost 10, another neutral running shoe from Brooks, and was very impressed by the ride. Launch 5 shoes are like a Swiss army knife: they are ready for everything, easy running, steady running, racing, everything! It’s a 360-degree shoe. I really like the design of the fifth generation of the Launch. Brooks offers a lot of options and very cool colour combinations. The upper mesh doesn’t have any plastic at all, which makes the shoe very soft, and the tongue isn’t cumbersome at all. They provide a much looser fit than the Ghost 10 and a slightly looser fit than the Glycerin 16. So, if you already have another Brooks shoe I recommend going half a size down for the Launch 5. In my case, the Launch 5 feels half a size too big compared with the Ghost 10. The bad news for male runners with small feet is that Brooks only produces the Launch 5 in UK size 7 and above. However, if you tighten the laces well you should be fine. The Launch 5 provides a very natural ride with just enough cushioning. It is also very light, especially compared with older versions, which makes it suitable for a wide range of running speeds. However, the outsole doesn’t have a lot of grip, which means these shoes are not suitable for trails, but you can master road running with the Launch 5 and consider track sessions, too. This shoe is suitable for neutral runners and for those with a mild degree of pronation or supination. It definitely isn’t suited for heavy runners. I really love the Launch 5 because these shoes are suitable for almost anything. They are good for easy running, steady running and racing from 5km runs to marathons. Launch 5 is a very light shoe, UK 7 weights only 243g. 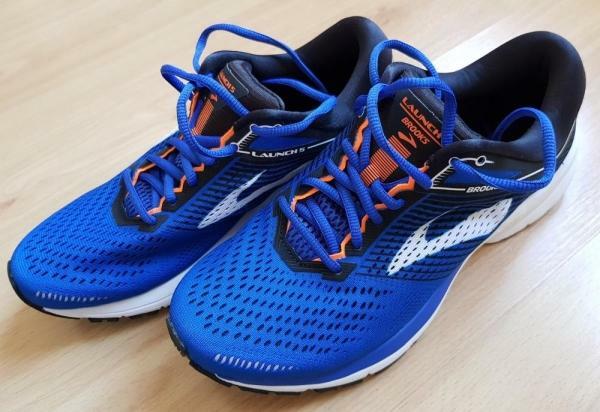 Compared with the two other neutral shoes from Brooks, the Ghost 10 and the Glycerin 16, the Launch 5 is the lightest and fastest, but it has the least cushioning of the three. Looking at other brands, its main competitors are the Adidas Boston Boost and the Nike Pegasus. The quality of the materials is good, but it doesn’t look like a very durable shoe. I expect that a pair of the Launch 5 will last for around 550km (350 miles), if not less. You may think that this is only the average life expectancy for a shoe, but I can tell you that it will be an intense life and you’ll have a strong relationship with the Launch 5. The first expected points of failure are the outsole and the upper mesh, unfortunately, softness comes with a price. If you are a one-shoe runner and you don’t want to rotate your shoes, including on race days, then the Launch 5 is the shoe for you. They are very soft and comfy, and the design is cool. Also, Brooks offers a wide range of colours. Launch 4, which is great because I will run my Launch 4 shoes into the ground before I let them go. Horrible puns aside, they did make a few changes which I will try to be thorough about without rambling on. I’ll start with the changes and move on to what is the same or similar. Click here to see my review of the Launch 4. The upper area was redesigned to be a solid piece of fabric mesh on the outside with a thin layer on the inside. I would assume the goal is to breathe better… but it doesn’t. For fun and to the amusement/bewilderment of my wife, I always put my hands in new shoes and wave them around quickly. With the Launch 4s, I felt plenty of air as I did this. Yet with the 5s, my best efforts to be a windmill yielded very little air flow. Going for runs outside had the same result as I could notice a difference when I switched back and forth between the two pairs. That being said, my feet never felt hot as the new setup works well to keep a comfortable temperature and keep the feet nice and dry. The other change I noticed was the toe box being slightly smaller. For me, this is perfectly fine and even welcomed as I have narrow feet. The Launch 3 had way too much box area while the Launch 4s felt roomy but not overly so. The tongue’s upper lace holder is gone now but it is not missed as the normal one in the middle is sufficient enough. 9.4 oz according to my scale. Seriously, that’s it. It’s almost ridiculous how lightweight these feel. Don’t let that fool you though, there is still plenty of cushion in the 10mm heel to toe drop to go at least 15 miles and still not feel any pain. I did long runs, tempo work, and even some hill work with these shoes and never once wanted for more support or cushioning. As with the Launch 4s, there is plenty of arch support and in no way would I want more even though I do have high arches. It wasn’t that I felt a strong support as if I was wearing a pair of Birkenstock sandals but that my arches never hurt and my run form was not altered in any way. The cushioning provides a nice bounce fresh out of the box and though that seems to dwindle slightly as they are worn-in, this could just be the DNA sole adapting to my foot which creates an overall smoother feel. The cushioning and the sole are the same as with the 4s – something I was excited to see and to feel. As always, the DNA sole adapts to the individual’s foot overtime and overall these had a slightly more relaxed feeling of rolling from heel to toe – though I am more of a forefoot striker. There is no noticeable change in the tread and as far as I can tell, Brooks left that the same. This is great because though these are road shoes, they work well on light trails or gravel type roads where there aren’t too many big rocks. I took these on a hilly 6 mile run with gravel roads and never noticed any pain or wished I had on thicker cushioning. They even do well if the surface is wet from rain – just like the Launch 4. I use the Brooks Launch 5 in the gym for weights, for HIIT style workouts, on the treadmill, and of-course outside on multiple terrains and found they work well for anything! Brooks made some changes to the Launch 5 and I actually love that they feel even more ready fresh out of the box. 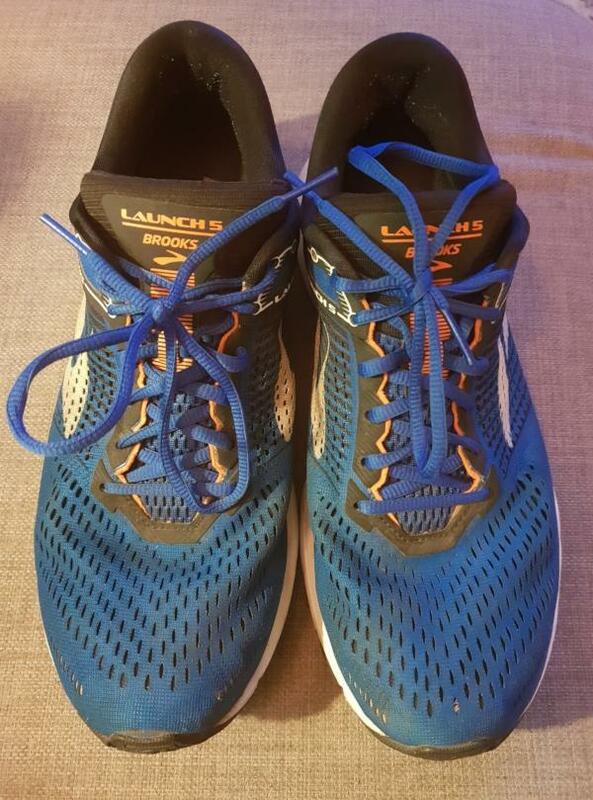 My Launch 4s were my shoe for my first half-marathon so they have a special place with me but I love the Launch 5s and have been rotating the two with each other. Pick up a pair and you surely won’t be disappointed! For those who need more cushioning or want a greater heel to toe drop – then go with the Ghosts! Brooks Launch, a series known because of its performance-driven design, continues to satisfy neutral runners with its newest version – the Brooks Launch 5. Brooks aims to deliver the same ride quality observed from the Launch 4. Thus, they continue to utilize the same materials and technologies used by its predecessor. A few enhancements have been made in the cushioning and outsole configuration of the shoe, but these improvements are not obvious especially if you don’t own any version of the Launch series. The major update is in the upper of the Brooks Launch 5. The shoe made use of an engineered mesh that is strategically designed for a more breathable foot coverage. The stretchy material also provides the foot a sock-like fit. The upper of the Brook Launch 5 features a new engineered mesh that is lightweight and flexible. The mesh material keeps the foot well-ventilated. It wraps the foot comfortably and delivers an adaptive fit. Along with the mesh upper is the internal bootie construction. It provides the much-needed all-day comfort for long-distance runs. The lacing system is the same as the ones that were used in the Launch 4. The laces are semi-round with a precise length, and there are extra eyelets to give the ankle a more secure lockdown. The Launch 5 also comes in well-padded heel collar and tongue. The collar and tongue were designed to give added foot security and comfort. In the midsole of the Launch 5 are the notable Brooks technologies – the BioMoGo DNA midsole and the Midfoot Transition Zone. The BioMoGo DNA midsole technology is a single-piece cushioning that delivers a responsive ride. It feels very lightweight and adapts to the natural movement of the foot for a more efficient gait cycle. On the other hand, the Midfoot Transition Zone offers a smoother heel-to-toe transition. For added underfoot cushioning and an enhanced fit, the shoe has a removable sock liner. It is made from lightweight BioMoGo foam and has a moisture-wicking capacity to keep the foot dry and odor-free. The Brooks Launch 5 utilizes the HPR Plus rubber in its sole unit. It is a durable rubber material that is specifically placed in the heel and toe. It gives the sole unit the sturdiness needed for road running. In the forefoot area is the blown rubber material. It is a soft rubber that gives flexibility and added traction on the road. The flex grooves are also visible in the outsole configuration. It gives maximum flexibility without affecting the cushioning of the shoe. The overall outsole design of the Launch 5 offers reliable traction on paved surfaces. It also provides decent grip on slightly wet running conditions. The Launch 5 fits true to size and is available in standard medium width for both men’s and women’s versions. I wear a size 7 and the shoe fits perfectly. It provides a secure and comfortable foot lockdown from the heel to forefoot. The toe box is roomy just like the Brooks Launch 5. Lastly, the internal bootie construction offers a soft, comfortable in-shoe feel. The Brooks Launch 5 provides high-level of comfort and breathability. The engineered mesh provides the foot a breathable coverage, keeping the foot cool and dry even on long runs. Also, the tongue and collar are generously padded. These work well with the soft internal bootie construction that is designed for an all-day comfort. The comfort and breathability of the Launch 5 are comparable to the Nike Air Zoom Winflo 4. The Winflo 4 features a smooth, breathable mesh upper for a well-ventilated ride. It also has a slightly padded collar and smooth lining for a more satisfying in-shoe feel. When it comes to overall ride quality, the Launch 5 won’t disappoint. Thanks to the BioMoGo DNA midsole that provides responsiveness and durable underfoot cushioning. The cushioning is just right for my liking – not too soft and not too firm. The Midfoot Transition Zone also provides a smoother heel-to-toe transition. The flex grooves have also contributed to the overall performance of the shoe. The grooves efficiently bend as my foot moves to different directions. Because of the light construction of the Brooks Launch 5, it feels so fast and disappears on my foot while running miles after miles. I was a bit disappointed with the shoe’s durability. I was expecting every aspect of it to be durable. However, after running a few miles, I noticed that the rubber material in the heel area started to show some wears. I own a few running shoes from Brooks and so far, the Brooks Ghost 10 is the most durable. Though it provides a fast and springy ride, the shoe is not durable enough for long-term use. Weighing 212.6 grams for women’s, the overall performance of the Brooks Launch 5 is undeniably satisfying. Brooks claims that the Launch 5 combines the speed of a racing flat with the cushion and durability of a trainer. 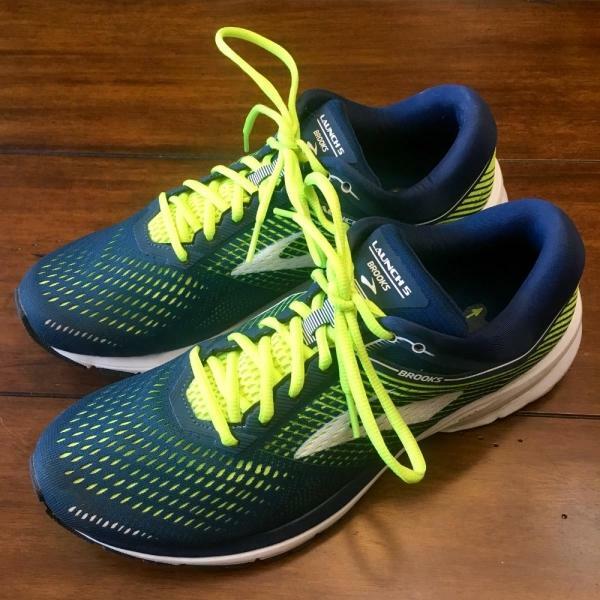 This was my first experience of Brooks running shoes and I have not been disappointed. This lightweight neutral offering from Brooks is a real head turner, feels great on and won’t break the bank. In a range of bright, vibrant colors the Launch 5 looks great (especially in blue and orange) although they are also available in a muted black and white option which are not so great in the looks department. The Launch 5’s have retained the BioMoGo DNA mid-sole and segmented crash pad found in the Launch 4. I'm led to believe that these shoes should last anywhere between 250 miles and 500 miles depending on your individual running style, your weight and the surface you predominantly run on. My pair of Launch 5 have now ticked over 450 miles and it’s fair to say it's now time to retire them. Overall, they have held out incredibly well apart from a bit of early heel sag on the one shoe. Although this may have been a sizing issue on my part, I went up half a size due to being informed that they come up small but I believe them to be true to size. After all these miles the cushioning isn't quite as good as it once was for me. Especially in the heel area which is to be expected due to my heel strike running style. I have used these shoes in multiple races across a range of distances including 10k, 24 hr team relay, off-road races and Parkruns (I know Parkrun isn't really a race). I have found them to be light and responsive whilst providing excellent traction on a variety of terrains. They are slightly firmer than other similar neutral shoes which fortunately is my preference. This definitely helps in regards to energy return on quicker runs in anything up to half marathon distance. Don’t be put off as there is still more than enough cushioning to see you through on longer runs as well as this truly is an all-around daily running shoe. Brooks really hit the mark with the Launch 5 as they succeed in ticking a lot of boxes required in a true all-around running shoe where others have fallen short. I would highly recommend them as a daily runner or for quicker training runs. However, if you’re a more serious runner then this won’t quite compete with a racer such as the Adidas Adizero Boston 7 and also do not provide the cushioning you would find in the Brooks Ghost 11. In summary, these have to be up there with the best all-around trainers in the market around this price point. So if you are after a versatile, responsive shoe then this could very well be the perfect choice for you. The Brooks Launch 5 is a neutral running shoe that’s designed for the roads. It features a more vibrant design compared to its immediate predecessor, the Launch 4, which had a subdued look. Open pores can now be seen in the new version, acting as ventilation ports for in-shoe air circulation. The printed overlays are thinner than the ones in the previous iteration, but they still aim to assist the rest of the upper in providing a secure fit. The midsole unit makes use of the regular components that are present in most of the brand’s stable of footwear. It has a full-length platform that’s made out of recycled materials, as well as an embedded insole for more cushioning and suppleness. Two types of rubber are placed in the outsole, and they work together to provide surface traction and protection against wear and tear. The Brooks Launch 5 is true to size. It accommodates the preferences of testers when it comes to length. The available width for men is D – Medium; for women, it’s B – Medium. It welcomes those who have regular foot-dimensions. Its semi-curved shape mimics the natural curvature of the human foot. The outsole unit of the Brooks Launch 5 features the HPR Plus, which is a rubber compound that’s highly resistant to abrasion. It shields the foam platform from the abrasive nature of the asphalt. It also provides traction for surface control. Blown rubber is placed in the forefoot section. Aside from rendering traction and shielding, it also ensures springy toe-offs through its responsive properties. Flex grooves are patterned all over the outsole. They make the platform more flexible, thus helping the inherent capacity of the foot to move through the gait cycle. BioMoGo DNA is the primary foam unit of the Brooks Launch 5. It’s made from recycled materials. Its purpose is to provide responsive cushioning and shock attenuation. It also molds itself to the shape of the underfoot, thereby affording some support to the arch and other curves. This midsole technology is also used in other Launch versions including the new Brooks Launch 6. S-257 Cushsole is a full-length material that’s placed on top of the thicker foam unit. It adds a bit more cushioning and responsive performance for the foot of the runner. The Midfoot Transition Zone is a slightly narrowed design in the middle area of the platform that allows the foot to move through the gait cycle with ease and comfort. A Segmented Crash Pad configuration allows the sole unit to isolate the impact shock to the specific areas of contact, letting the force travel in conjunction with the gait of the foot. This design further heightens the flexibility of the midsole. The Engage Sockliner offers additional cushioning for the underside of the foot. Its presence doesn’t hinder the platform’s suppleness. The upper unit of the Brooks Launch 5 features Air Mesh, a fabric-like material that wraps around the foot like a sock. It has open pores which allow environmental air to enter the foot-chamber and keep the foot well-ventilated. Thin overlays are printed onto the mesh. They outline the façade with lines and highlights. They also help in providing a secure yet uncomplicated coverage. The padded tongue and collar give cushioning to the top parts of the foot. They are also responsible for the prevention of in-shoe wobbling and accidental shoe-removals. A smooth textile lines the interior of the Launch 5. It prevents discomfort or irritation to the skin.